The initial purpose of this project is the development of a comprehensive and collaborative global strategy for "creating a world that works for everyone". As the project matures, we are supposing this strategy can lead to the emergence of a broad multi-purpose global alliance of individuals and organizations who support the strategy and share our objectives, and who see a strong and useful place for themselves within it. The alliance could operate within the framework of a collaborative agreement, and be guided by a universal ontological archetype. This approach supports the emergence of an organization that maintains unity and coherence in its general attributes, while enabling a high degree of local autonomy and independence. Because our approach is integral and holistic and guided by a universal archetype, we believe a collaborative framework of this type could emerge as an effective working solution for the many interdependent crises in national and global civilization. Because the project is developed and coordinated over the internet, it should be possible to resonantly coordinate the activities of thousands of autonomous special-purpose groups, each pursuing its own objectives, in a framework that helps maintain coherence among all participants, regardless of their locale. Each of these autonomous groups might operate as a resonant circle with its own objectives, and the entire alliance operate somewhat like an international agency or corporation, where a central facility or hub coordinates the activities of thousands of local nodes. We are beginning with existing proposals and projects we find resonant, and doing what we can to cohere these visions and proposals into a single design for effective collaborative activism. The project is intended to activate at all levels of scale, from the local to the national to the international. All activism and world transformation can and should be integrally held within the context of Oneness or The One (Logos). The concept of "community" is a template that can be replicated at all levels of social organization, from the local to the regional to the national to the international. All things are interconnected; everything is connected to everything else. This includes people, communities, and political issues. Project solutions and strategies should be "holistic, integral, and collaborative". In a world of extreme diversity and differences, this project works on a basis of trust and resonance. Resonance is an energetic bond between people that can help bridge the semantic gaps in understanding based on words and concepts. We look for ways to correctly understand one another. How can Logos expand our understanding of scientific method? How can Logos function as a universal and absolute foundation for transformative global collaboration? What unique contribution are you or your group bringing into the global convergence? What are your primary objectives and intentions? What is your mission and what do you hope to accomplish? How can you form constructive alliance with others also working for your objectives? As you review our emerging collaborative global strategy, how do you see yourself and your group fitting in to this strategy? This inspiring video lecture from Dr. Ashok Gangadean is a fast-moving 40-minute synopsis of all things interreligious, intercultural and interdisciplinary. In a detailed recitation and overview, he brilliantly introduces core ideas underlying the universal and "literate" global spirituality that emerges when cultures intersect in creative and illuminating ways. 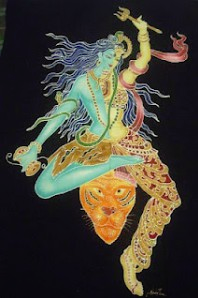 Hear the call, engage the other, flow into resonant enlightenment, enter into the Logos where our diverse cultures meet! 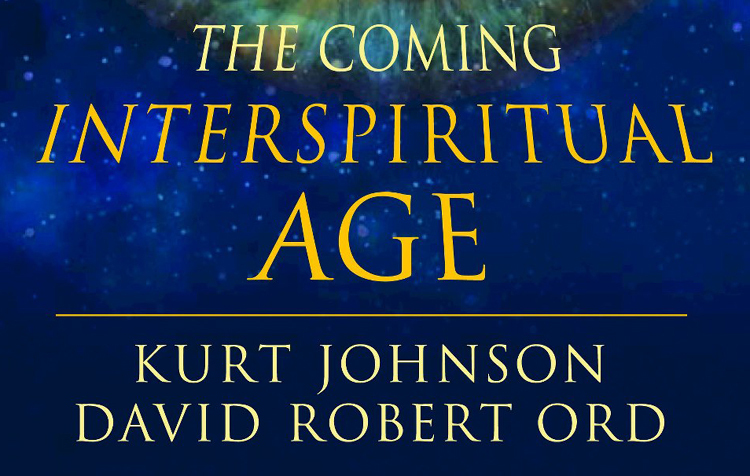 This new book by Dr. Kurt Johnson and David Robert Ord details the vision of interspirituality within a comprehensive and powerful synthesis of world religions and spirituality, the discoveries of modern science, and the developmental and evolutionary view of history. It is the first book to review and predict the ongoing history of world religions and spirituality in the context of developmental history, the evolutionary consciousness movement, and current scientific understandings of anthropology, human cognitive development, brain/mind and scientific consciousness studies. The book addresses Brother Wayne Teasdale’s vision of “The Interspiritual Age,” a vision that parallels the equally well-known and publicized visions of the world’s developmental and evolutionary consciousness movements (known therein as the coming “Integral Age” or “Age of Evolutionary Consciousness”) and the international humanist movement (known therein as the emerging “International Ethical Manifold”). As such The Coming Interspiritual Age is the first synthesis of interfaith and interspirituality with the popular writings of integral leaders Ken Wilber and Don Beck. The Bridge Across Consciousness is a design for integrating the conceptual levels of human thinking through a single spectrum. It connects "the one" to "the many", across a series of descending levels of abstraction that extends from the transcendent to the empirical. This framework can interpret the entire structure of the human mind and all the branches and departments of knowledge. 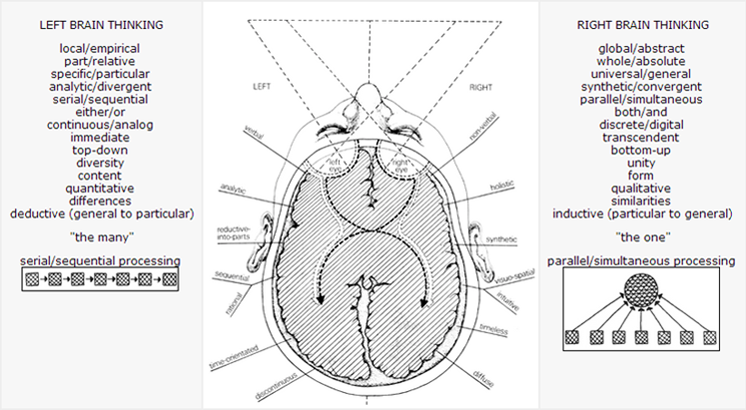 This diagram outlines the major features of this concept, linking the parallel processing and transcendence of the right brain (high levels of conceptual abstraction) to the linear and empirical thinking of the left brain (low levels of conceptual abstraction), and positioning all other human cognitive activities somewhere along the spectrum between them. This charming video shows highlights from the recent conference of the National Coalition for Dialogue and Deliberation. Turn on your sound. "Everything is alright with me. Baby I got everything I need. "I don't have a lot, but I love what I got, and that's the key..."